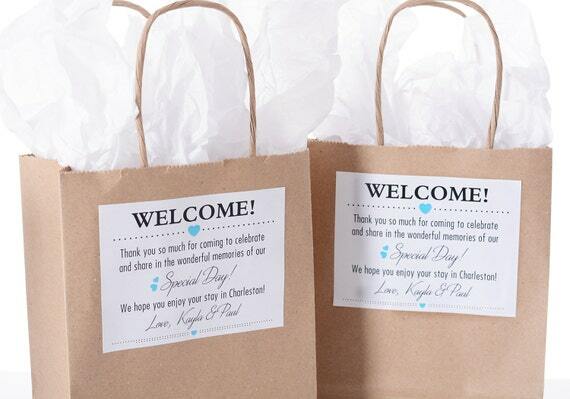 Wedding favor bags with personalized labels are a perfect way to welcome your wedding guests! The stickers measure 4" x 3" with adhesive backing and can be purchased on their own if you don't need the bags. SMALL: 5.5" x 3.25" x 8.75"
MEDIUM: 8" x 5" x 10"
This listing is for a set of 25 bags and labels. Labels do not come pre-assembled on the bags. 1. Most orders are shipped within 24 hours of proof approval, but please allow up to 3 days in-house printing time unless you need a rush job. 2. We can almost always accommodate rush orders. Convo us for details. 3. We ship by US Postal Service Priority Mail. Overnight services are also available by request.